Celebrating your 40th birthday can be a little bittersweet, but it is such a great milestone that it deserves to be celebrated! If you are just starting to think about planning your 40th birthday party, you are in luck! Our team at Waterside Events was thinking about the best milestone birthday parties we’ve hosted, and gathered some great ideas to help inspire you. We love it when grown-ups have kid’s inspired birthday parties. You can go all out with party decorations, with colourful balloons, backdrops, and table settings, and get creative and nostalgic with party foods and drinks – think party pies, mini burgers, hot dogs, pop-corn, and, of course, lots of lollies and fairy bread! You can also have a piñata, some exciting games like giant Jenga, and maybe even a bouncy castle! For some serious summer fun, why not set up a slip and slide for adults? Instead of trying to hide your age, we say embrace the number! Incorporate it into the décor, but stay away from tacky balloons and store-bought signs. Instead, use black and white photos of your favourite moments throughout your life, and arrange them to make a classy and unique backdrop for the desserts table like the one in the photo from nobiggie.net – though the example below was for a couple’s 40th anniversary, it would also work for a fortieth birthday party. Helium balloons are also a great idea to incorporate the ‘fabulous at 40’ theme into your party. Have it at the entrance, as a backdrop to the buffet table, or near the photo booth area, so they can be a part of your guests’ memories as well. If you are really just not into embracing your age, we recommend making it all about you then. It is your party, after all. Get personalised napkins, coasters, bottle labels, centre pieces, the list goes on! Get helium balloons and spell out your name, make it all about you and all the amazing things you’ve accomplished in your life, and start dreaming and planning for the next decades of your life. When it is time to plan your 40th birthday party, you make the rules. 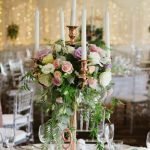 Whether you want to include the whole family or make it a child-free event, if you’re having a barbecue or if you are serving soups and salads, the first thing you need to decide on is a venue. At Waterside Events, we have amazing rooms to suit your events, no matter how many guests you are inviting. If you’d like to book a site inspection for your celebration soon, get in touch with our staff today and book a venue inspection. Call 07 5534 0970 or Click Here.